Thanks to our very good friends at Universal Music Australia, we have FIVE CD copies of the awesome new John Mellencamp release to give away to five of our lucky readers. 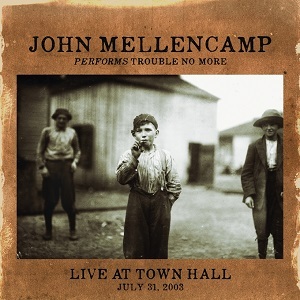 This is a live recording from July 31, 2003 and is a must for any fan of Mr Mellencamp. John Mellencamp’s Trouble No More was released in June 2003, received with universal critical acclaim and a No. 1 debut on Billboard’s Blues chart. Featuring Mellencamp and his band’s spirited take on 11 American folk and blues classics, including Robert Johnson’s “Stones In My Passway”, Son House’s “Death Letter”, Woody Guthrie’s “Johnny Hart”, Willie Dixon’s “Down In The Bottom”, Lucinda Williams’ “Lafayette”, and several others, the album was recorded and mixed in just 17 days, capturing the sessions’ bounding energy. A month after the release, Mellencamp performed this acclaimed studio album, Trouble No More, and four additional songs, including stripped-down versions of Mellencamp’s “Small Town”, “Paper In Fire” and Pink Houses”, as well as Bob Dylan’s “Highway 61 Revisited” for a sold-out audience at New York’s Town Hall. This newly mixed and mastered concert recording, John Mellencamp Performs Trouble No More Live At Town Hall, will make its release debut in CD, digital and vinyl LP formats. The CD and digital audio packages both feature the complete 15-song concert, while the vinyl LP highlights 10 performances from the show. All physical configurations include a new essay by Bob Merlis.